Every once in awhile, I'll write a book review. Just my humble opinion. The author, I'm proud to say, is a good friend (that's why I can say he looks like a wild man in the photo above!) and former co-worker - Woody Woodburn. Don't misunderstand me when I say Strawberries in Wintertime is an easy read. What I mean is it's like going for a walk with a good friend who is sharing sincere life observations with you. You can almost feel a pat on the back as you slip into the narration that skillfully skips from one subject to another in a playful arrangement of stories. It's hard to put down and when you're done, you want to hear more. It's that good. The good news is he writes a weekly column at the Ventura Star and you can go to his blog HERE to follow it, and there's also links with more of Woody's work. 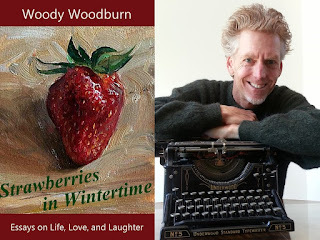 I highly recommend Strawberries in Wintertime for a refreshingly insightful look at life. In addition, Woody is a national award-winning columnist and author of "WOODEN and ME: Life Lessons from My Two-Decade Friendship with the Legendary Coach and Humanitarian to help "Make Each Day Your Masterpiece." Funny thing. The last time I did a book review it was Woody's masterpiece WOODEN AND I (Posted May 29, 2013).